Some of you will know the main facts of my story already. But for those of you that don’t, it probably bears re-telling. It really begins in 1980 when I graduated as a biological scientist and decided to go to London to do research for a doctorate. I was very interested in brain neurochemistry and in how neurotransmitters control our mood, emotion and movements. In particular I was interested in dopamine which seemed, to the young researcher you see on the left, to be an exciting and pivotal brain transmitter. I was fascinated by how so much of the brain’s function could be controlled by such a small molecule. Although it wasn’t intended, the hospital where I chose to do my doctoral research was the Royal London Hospital in Whitechapel. As some of you may also know, this is the hospital where James Parkinson trained as a doctor. So I specialised, so to speak, in dopamine, learning everything I could about the way in which it was released from nerves, how it allowed communication between nerve cells and how those processes were governed in health and disease. Not surprisingly it wasn’t long before I found myself working in the field of Parkinson’s, trying to work out how drugs and drug combinations might alleviate some of the symptoms of this illness. I worked on L-dopa, benztropine, bromocriptine, pergolide, rotigotine and selegiline, to name a few. Perhaps one of the ironies of my research was the fact that I actively studied all the drugs that I now take as treatments. The research also opened doors worldwide. I travelled widely and spoke at meetings. I met many superb scientists and physicians and even worked in the United States, in California and Indiana, after I got my PhD. These were exciting times as we began to tease apart the many factors that influenced dopamine function in the basal ganglia and how they went wrong in Parkinson’s. 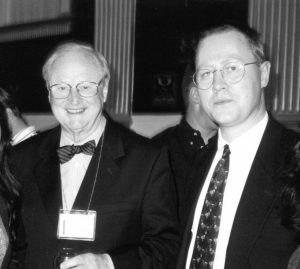 Perhaps the highlight of my academic involvement with Parkinson’s was in 2000 in Dublin when I spoke on the same bill as Arvid Carlsson who had just been awarded the Nobel prize for medicine for his 1960s discovery of dopamine as a neurotransmitter. For more than two decades I researched dopamine and Parkinson’s and lectured to medical students about the features of Parkinson’s and how it was treated. So when, in 2006, I began to notice that I stumbled and that my right hand trembled a little, you would think that I would have recognised the symptoms for what they were. But bizarrely, whether denial or otherwise, I somehow contrived to find other explanations. 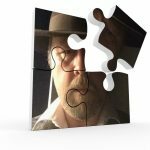 I think partly I deluded myself into believing that it was too much of a coincidence – working on Parkinson’s and then contracting it myself. Just too much of a coincidence. In actual fact, it was not the tremor and postural instability that led me to seek medical advice. I had been working for the Open University, teaching biological psychology in 2006 and I was marking scripts in September. Anxious not to repeat stock phrases I used in March, I looked at my March reports. Placing them, side-by-side, with what I had written in September I was aghast. I simply could not believe that the handwriting was by the same person. Full of curves and loops in March, it was splintered and scratchy by September. As luck would have it, I already had a doctor’s appointment for later that day. I had a frozen shoulder and was anxious to get some pain relief. Many of you will nod in recognition of this classic presenting symptom. You may also shake your head in incredulity at my failure to recognise this as another part of the Parkinson’s jigsaw. The doctor was sympathetic to my frozen shoulder and suggested a steroid injection. He was just about to write a script for it when I said that the immobility was a nuisance because it was affecting my handwriting. Neither of us needed to use the word. We both knew what it was and what it meant. The diagnosis was formally confirmed a few weeks later when the DATscan revealed that a life lived on other people’s dopamine must now turn inward. While researching how to increase dopamine function in others, I failed to notice that my own needle was in the red. But although you can take the scientist out of science, you can never really take science out of the scientist. I took comfort in monitoring my symptoms, learning what I could about the meaning and consequences of each. I was fascinated by how diet and exercise could affect my symptoms. I noted that my tremor had a different frequency in the morning and in the evening. I speculated about thalamocortical feedback loops. I often like to think of my life in terms of dopamine. The first part was a feast and the latter part is a famine. But more than that, I’m often asked how the former informs the latter. Does the fact that I’ve been a neuroscientist actively researching dopamine and Parkinson’s give me any particular insight into a life without? I think it does. The many excellent scientists I have met along the way are a source of hope and confidence in the future. To my mind, and as a scientist you would expect me to say no different, our best hopes for treatments and ultimately a cure lie in the hands of the scientific corps. I don’t believe in conspiracy theories. I do not believe, and I say this from my experience, that these are men and women whose souls are sold to Mammon, people for whom career dominates compassion. Nor do I believe that the pharmaceutical industry has no vested interest in finding a cure. These are all conspiracy theories and those that promulgate them belong in the same dustbin as people who disbelieve the Apollo landings or the Holocaust. Our scientists are honest decent people playing their part in this war. Their industry and endeavour fills me with hope. It is our duty, as patients, to imbue them with compassion, purpose and, above all, urgency. One of the great strengths of the World Parkinson Congress, held every three years, is the heady mix of patients, scientists and physicians. This blend is a human catalyst for research. Many bench scientists, like my former self, never met a patient. For many attending the meetings the experience is revelatory. The late hours in the laboratory suddenly make sense. The purpose of their work is crystallised in front of them. And this is not one way traffic. Patients ask questions and, once the awkwardness is overcome, scientists like answering. I remember when I was a scientist being thrilled that anyone was interested in my work. But what about the physicians? Sadly there is still work to do there. For every bright young neurologist who understands the value of patients as more than just trial subjects, there are still a few old dinosaurs who don’t quite get it. But time and increasing intellectual isolation will soon enough change that. In the meantime, we as patients have to rid ourselves of gullibility and desperation and take on the mantle of sense and sensibility. Rational drug discovery and development is not our best shot at a cure – it’s our only shot. 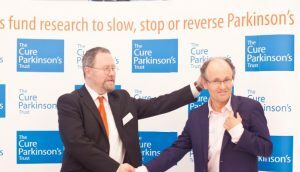 It crosses my mind that many of you reading this may be doing so because you too have been diagnosed with Parkinson’s and that you are perhaps looking for guidance or some indication that people can cope, and do cope, with this illness. I have lived with this now for nearly ten years and my best piece of advice to the newly diagnosed would be, in Douglas Adams’s words “don’t panic”. It is possible to live with this condition, and to thrive even. Although Parkinson’s will change the things you do, and the way you do them, it will only stop you if you allow it to. People often react to a diagnosis of Parkinson’s in one of two ways. There is the path of destruction, or more accurately self destruction. Don’t ask the question “why me?” because it will lead you nowhere. Besides it had to be someone. Then there is the path of affirmation. Parkinson’s will be with you every day and every night. It’s an unwelcome houseguest, a squatter even. But until that glorious day when we can evict it from our lives, we would do well to make the best of it. That’s not to say that it’s easy. It isn’t. It’s not say that the path is smooth. Again it isn’t. You have Parkinson’s, but the Parkinson’s does not necessarily have you. You can be defeated or defined by this condition. 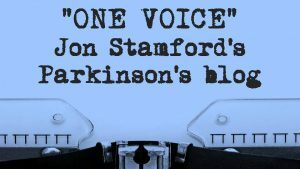 Parkinson’s can, in so many unexpected ways, give as much as it takes. It’s up to you to enjoy those gifts. And you will. Believe me, you will.